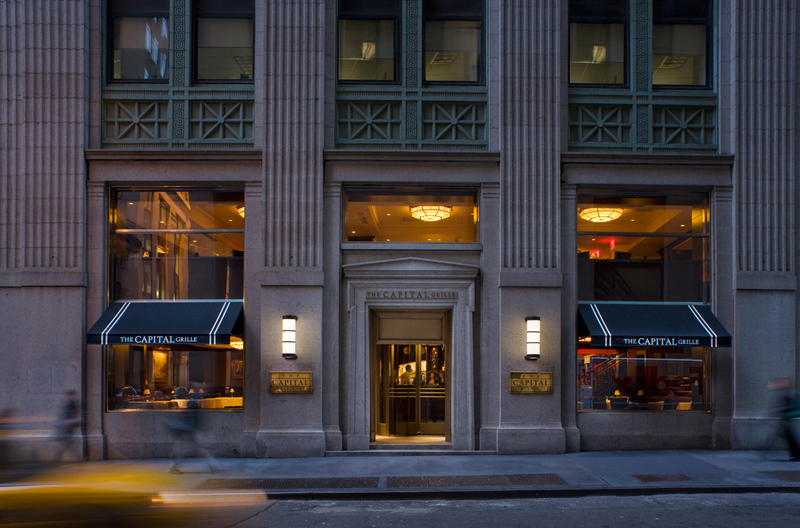 Wine Lovers of NYC is excited to offer a great wine and food pairing at the Capital Grille Wall Street on August 9. For $90 (tax and gratuity included) you will have a prix-fixe meal (menu choices below) accompanied by unlimited pours of the Grille's annual "Generous Pour" program (note that to RSVP you must pay a deposit of $10 that will be applied to your dinner check). This year the wines are "Rebels, Rule Breakers & Game Changers," seven pioneering wines from Italy, Australia, Napa Valley, Alexander Valley, Santa Barbara and Stag's Leap. Sommelier Mark Bruner will comment on each wine pairing. ﻿​The Sommelier: Mark Bruner, with over 25 years in the restaurant industry, he has a passion for wines of distinction. He took over the role of Wine Director at The Capital Grille in 2014. Since his inception, he has crafted a wine list that has been awarded two wine glasses in the Best of Award of Excellence by Wine Spectator for two consecutive years. The Wines: (Watch videos about each of these wines at http://www.thecapitalgrille.com/events/the-generous-pour-wine-tasting ). This year’s Generous Pour wine event is a tribute to some of the boldest, risk-taking winemakers in the world. They have each crafted indelible wines that have raised the bar for all others. The wines you’ll enjoy at The Generous Pour this summer have extraordinary pedigrees. They were crafted in unexpected places or by unconventional means, but are of such exceptional quality they have become the benchmark for their varietals. Stellina Di Notte Pinot Grigio: Created in the foothills of the Italian Alps—home to the most famous Pinot Grigio in the world—this bright, lively white is the result of a unique partnership of American innovation and traditional Italian winemaking. Classic in style but modern in taste. Tasting Notes: A splash of Chardonnay contributes to the flavors of fresh citrus and green pear, with notes of white flowers. Provenance Sauvignon Blanc: A gamble on growing white grapes in the traditionally red region of Rutherford, Calif., paid off big. Experience what is possibly the finest expression of Sauvignon Blanc in the Napa Valley. Tasting Notes: A clean, polished beauty featuring intense flavors of tropical fruit and citrus, with floral and mineral notes. Chateau St. Jean, Robert Young Vineyard Chardonnay: In 1975, this bold winery did the unthinkable; they produced a Chardonnay from a single vineyard. Enjoy this benchmark wine from the renowned Alexander Valley before or with dinner. Tasting Notes: Distinctive, Robert Young Vineyard aromas of bright citrus and ripe stone fruit with flavors of nectarine, lemon, toasted almonds, and baking spice. Lyric by Etude Pinot Noir: Produced by winemakers who in 1982 had the rebellious determination to grow one of the world’s most unforgiving grapes, while being one of the first wineries to adapt their winemaking technique and philosophy to suit the land. Don’t miss what most consider the finest and truest expression of Santa Barbara Pinot Noir. Tasting Notes: Elegant and silky, presenting flavors of ripe cherry and red raspberry with hints of cinnamon, cardamom, sandalwood, and cola. Penfolds Bin 2 Shiraz Blend: In 1951, the Penfolds winery set out to create a world-class red to rival the finest in Europe, forever altering the landscape of Australian wine. Enjoy Penfolds Bin 2, from the winery to produce the Shiraz that made Australian Shiraz famous, and remains the standard today. Tasting Notes: Not a shy wine, it presents savory aromas of smoke, paprika, and star anise, as well as flavors of plush fruits and dark chocolate. Stags' Leap, The Leap Cabernet Sauvignon: From the first California winery that named a growing region, enjoy a Stags’ Leap wine normally only available in the estate’s tasting room. “The Leap” is yours to truly enjoy exclusively at The Capital Grille during this special event. Tasting Notes: Intense and finessed, with flavors of blackberry, cassis, and cranberry enhanced by notes of black pepper, cedar, coffee, and cocoa. Beaulieu Vineyard, Tapestry Cabernet Blend: A bold decision in 1938 to use French oak barrels resulted in California’s first “cult” Cabernet. Since 1990, Tapestry has consistently been one of the finest examples of a Bordeaux blend in the Napa Valley. Tasting Notes: Rich and chewy, layered and complex, with flavors of blackberries, black currant, and a hint of truffle. The event will be the three course menu and unlimited tastings of the wine listed above with descriptions and wine talk lead by the sommelier. The price for the dinner is $90 plus tax and gratuity. To RSVP please pay $10, which will be applied to the full cost of the dinner. No cancellations within 24 hours of the event.